Wearing a "V" neck low cut dress? Pink toggle is is for you. 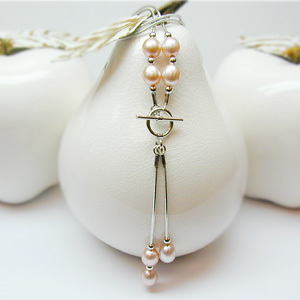 Designed with a high quality pink oval pearls and sterling silver chain. The three pearls will swing and sway with you. American Bridal Jewelry, caters to the modern bride with fashionable jewelry of all kinds, such as necklaces, chokers, earrings, rings, bracelets and pendants. From the basics to the fine detail of accessories, American Bridal Jewelry is your one source for wedding jewelry and accessories made of variety of material from freshwater and cultured pearls to gemstones and diamond jewelry we have them all. But we don't stop there, American Bridal Jewelry wants your Honeymoon after the wedding to be as special and memorable. So, don't forget to check out our "Honeymoon Treasures" page and prepare early and just enjoy the moments.